24 red roses with matching greenery and gypsophila. 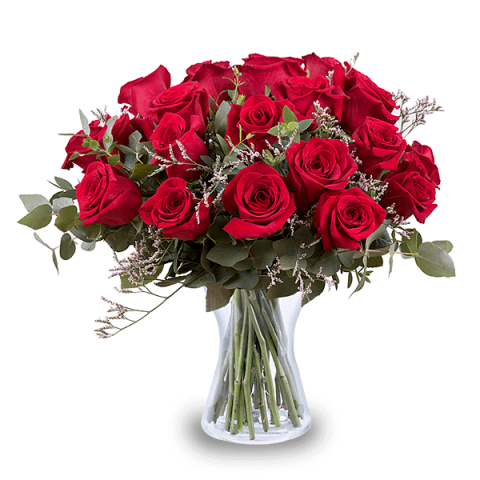 Send rose bouquets to surprise your partner or make any day more romantic in 100+ countries with FloraQueen’s international flower delivery service. 7 days freshness guaranteed on all bouquets. Sending roses to your love on Valentine's Day is one of the best ways to share your affections on this special occasion. 12 red roses delivered right to their door is rightly seen as deeply romantic gesture that shows your special someone that you care deeply about them. Roses have an almost magically romantic effect on someone you love on Valentine´s Day and we deliver roses of all types. Whatever the colour and whatever the pairing we can help you choose the most beautiful and elegant floral combination from our selection. Roses with their delicate and crisp petals and luscious distinctive scent capture the imagination more than most flowers and for centuries have been admired by royalty, artists and lovers alike. Perhaps you want to keep it traditional by sending a bright bouquet of 12 red roses or perhaps you would like to try something more unique like a combo of pink and yellow roses to surprise your beau. Every order with us is customisable in some way. Perhaps you want to write and send an epic sonnet professing your love for your darling or maybe you want to keep it shorter with a traditional Valentine´s greeting. We can help you do that with our selection of romantic greetings card add-ons. We also have a range of stylish vases, which will allow your love to choose somewhere special to place their flowers. Flowers and roses around the home always add a little extra joy to a household. We also have fantastic combinations of rose bouquets and other romantic gifts such as chocolate baskets from select chocolatiers, Champagne to celebrate Valentine's Day in style and soft toys to make their heart go gooey. We offer international delivery, so wherever you are and wherever your sweetheart is is no obstacle. Seamlessly send your flowers anywhere worldwide through our extensive network of expert international florists, with 7 days of freshness guaranteed. We know that the quality of your flowers matter greatly so we do everything we can to make sure they arrive on time and in the best condition possible. We even offer same day delivery just in case your need to make a last minute delivery.